Numbers 20:10-12 And Moses and Aaron gathered the congregation together before the rock, and he said to them, Hear now you rebels. Must we bring water for you out of this rock? (11) And Moses lifted up his hand, and with his rod he struck the rock twice. And the water came out plentifully, and the congregation and their animals drank. (12) And Jehovah spoke to Moses and Aaron, Because you did not believe Me, to sanctify Me in the eyes of the sons of Israel, therefore you shall not bring this congregation into the land which I have given them. John 19:34 But one of the soldiers pierced His side with a lance, and instantly there came out blood and water. We are meant to see a parallel between this rock and the Messiah, and Paul points it out in 1 Corinthians 10:4. …they drank of that spiritual Rock that followed them: and that Rock was Christ. There are several traditions concerning this rock that may or may not be true. For example, some say that the rock actually followed the Israelites around the desert and that it really was a pre-incarnate appearance of the Messiah. Others say that Moses’ first strike drew blood from the rock. Only his second strike drew water. Make of that what you will. I had another thought while reading this passage. There are two ways in which Yeshua’s people strike him: legalism and licentiousness. Both attack him through disobedience. Legalism replaces God’s commands with man’s or elevates the words above the one who gave them through Moses (which is essentially the same thing since the greatest commandment of all is to love the Lawgiver with all your being). Licentiousness simply dismisses God’s commands as irrelevant, elevating the subject above both the words and the master. Mark 7:7-9 However, they worship Me in vain, teaching for doctrines the commandments of men.” (8) For laying aside the commandment of God, you hold the tradition of men, the dippings of pots and cups. And many other such things you do. (9) And He said to them, Do you do well to set aside the commandment of God, so that you may keep your own tradition? Romans 6:1-4 What shall we say then? Shall we continue in sin so that grace may abound? (2) Let it not be! How shall we who died to sin live any longer in it? (3) Do you not know that as many of us as were baptized into Jesus Christ were baptized into His death? (4) Therefore we were buried with Him by baptism into death, so that as Christ was raised up from the dead by the glory of the Father; even so we also should walk in newness of life. If we love God, we will obey his commandments. That is not just a commandment on it’s own. It’s a statement of fact: If you love God, you will obey God. Matthew 5:19 Therefore whoever shall relax one of these commandments, the least, and shall teach men so, he shall be called the least in the kingdom of Heaven. But whoever shall do and teach them, the same shall be called great in the kingdom of Heaven. 1 John 4:20-21 If anyone says, I love God, and hates his brother, he is a liar. For if he does not love his brother whom he has seen, how can he love God whom he has not seen? (21) And we have this commandment from Him, that he who loves God should love his brother also. To learn how to love your brother (Don’t presume that you already know! Our culture hides many hateful things under the guise of love. ), I suggest you first read the Letter that James wrote to the exiles of Israel. (James 1:1-5:20) After that, go back to Moses. He wrote several books on the subject. 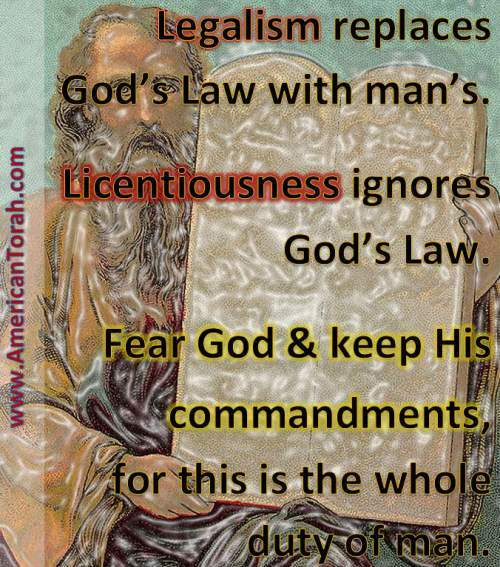 Legalism replaces God’s Law with man’s, while licentiousness ignores God’s Law. Reject both. Fear God and keep His commandments, for this is the whole duty of man. Update July 1, 2009: As the rock gave water even when Moses disobeyed God’s instructions, to an extent, so too does God give his Spirit to both legalists and antinomians. Yeshua said that those who do not keep Torah or do not teach others to do likewise will be called the least in Heaven, implying that they would at least still be there. Walking in a roadside ditch will still get you to the right place. It will just be a slower and more difficult journey. Numbers 33:55 – But if ye will not drive out the inhabitants of the land from before you; then it shall come to pass, that those which ye let remain of them shall be pricks in your eyes, and thorns in your sides, and shall vex you in the land wherein ye dwell. Ecclesiastes 3:1,8 – To every thing there is a season, and a time to every purpose under the heaven….A time to love, and a time to hate; a time of war, and a time of peace. God is loving, longsuffering, and merciful even while He hates, takes vengeance, and executes justice. Most of the time, the best course is to live and let live, to forgive and make peace. Every now and then, however, making nice just makes you a victim. 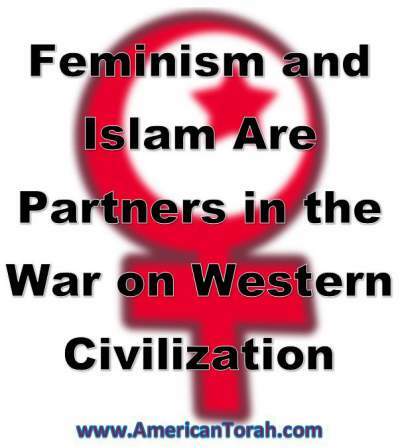 Feminism and Islam are natural partners in the destruction of Western Civilization. …even him whom he hath chosen… God constructed the world to function in a certain manner. Like any complex machine, Creation’s functionality degrades as its components cease to function according to design. The extent of the dysfunction can be difficult to measure. For example, an automobile without brakes might travel along an uncrowded highway without incident. The driver only realizes his trouble when it becomes necessary to slow or stop. So it is with family structure, church organization, and civil government. As Western nations become more and more feminized, they are beginning to come apart at the seams. As backwards as the Muslim nations appear, they have a very distinct advantage in that feminism has not taken a significant hold within their borders or cultures. As these two civilizations clash, the conclusion appears to be foregone. The superior technology and wealth of Europe and North America enable them to win many battles even as their borders are flooded with Muslims and other immigrants who have no interest in adapting themselves to the existing cultures. Instead they bring their own culture with them and destroy Western Civilization by forfeiture. Our politicians say that we are fighting them over there so we don’t have to fight them over here. Anyone with eyes to see can tell that they have no need to fight us anywhere. Until we excise the cancer of feminism from within our own people, we will go on committing cultural suicide. The military adventures of the Bush-Clinton-Obama cabal are the death throws of a very broken machine and the Muslims need only bide their time to win. Tashlikh is supposed to be done on Rosh Hashanah, but I think Yom Kippur is really a much better time for it. The idea is that you take stones that represent your sins, and you throw them into the sea or whatever body of water you can find, preferably water that is moving toward the sea. Yom Kippur is the day of atonement, and while we can do little things to make our wrongs right, only God can really make them go away. Like Egypt’s chariots and like the army of locusts before them. Beyond reach, beyond memory. Jonah ran from his calling. While I haven’t been running from mine, I haven’t exactly embraced it either. I have some writing to do, and I have neglected it all this year. Pharaoh raged against God. I allowed anger and hatred to set the tempo and the terms for this past year. I made some difficult and harsh decisions. I made the right decisions–I don’t think there was any way to avoid it–but I could have done it with more grace and civility. So now I’m going to go throw my good buddies, Jonah and Pharaoh, into the pond a few blocks away. Then I’m going to try to set some past wrongs aside and concentrate on turning some very unpopular thoughts into electronic bits. Psalm 19:1 The heavens declare the glory of God; and the expanse proclaims His handiwork. God speaks first to the leaders. If they don’t listen, he speaks directly to the people. If the people don’t listen, God speaks to the whole creation, and it always responds. God wants to have a relationship with his creation through us, but he does not need to work through us. To God we are a luxury, something he goes out of his way to enjoy. He relates to us only because he so chooses. God will have a relationship with his creation with or without us. His Word will always be proclaimed by someone or something and will always be heard. No objection, no legislation, no denial can ever change that. The question is, will we hear? Will we speak? Deu 29:14 – Nor do I make this covenant and this oath with you only, but with him who stands here with us today before Yahweh our God, and also with him that is not here with us today. The Law of God applies to all men in all times who would please him by their lives: civil, religious, military, and familial leaders; men, women, and children; foreign laborers; everyone near and far, and more; all who have left the world to be called by God’s name. Once we have come out of the world (aka Egypt) to serve him, he expects us to follow his rules. We do not obey for salvation from the final death, because Israel was saved from death in Egypt by the blood of the Passover lamb and baptized by their passage through the Red Sea before ever receiving this Covenant. Their faith in God’s promise saved them, not circumcision or observance of the Sabbath. He wants us to obey his rules, because they are his rules. Although the Law was given for our own prosperity, it is not optional. How can we call him Lord and then act as if his commands are merely helpful suggestions? Sept 6, 2007, update: Deuteronomy 29:29 says, “The secret things belong to Yahweh our God, but the revealed things belong to us and to our sons forever, so that we may do all the words of this Law.” Among the “secret things” are many whys. Why should we worship this way and not that way? Why does it matter if a pig doesn’t chew its cud or if a rabbit doesn’t have split hooves? 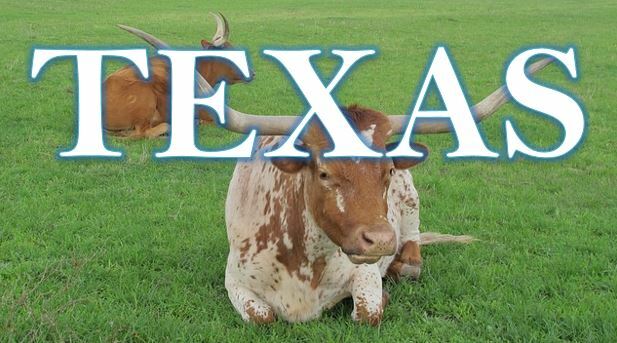 What difference does it make if the ashes are of a red heifer or of a Holstein? We can speculate about the things God hasn’t told us, but when push comes to shove, what matters is obedience. If we really have faith in God, we will obey his Word, especially when we don’t understand it. Deep mysteries that are irrelevant to us, are beyond our comprehension, or that might harm us if revealed. The revealed things are those which we can sense or examine. Secret sins–victimless crimes–that God deals with privately so long as they are not flaunted. The revealed things are those which are made public and have identifiably direct victims, such as murder, theft, and adultery. In this post I dealt with the first interpretation, but I think they are probably both correct in different contexts. When the LORD your God shall cut off the nations before you, where you go to possess them, and you take their place and dwell in their land, take heed to yourself that you do not become snared by following them, after they are destroyed from before you, and that you do not ask about their gods, saying, How did these nations serve their gods, that I too may do likewise? You shall not do so to the LORD your God. For every abomination to the LORD, which He hates, they have done to their gods; even their sons and their daughters they have burned in the fire to their gods. All the things I command you, be careful to do it. You shall not add to it, nor take away from it. Regarding Christmas, there are good things and bad things, but the most important consideration for me is what pleases God. In Deuteronomy 12:29-32, God said not to learn how the former pagans used to worship their gods and then do the same for him. He told us how he is to be worshiped, and we are forbidden from adding to it or taking away from it. Christmas is to holidays as English is to languages. They are cultural borgs, assimilating everything they touch. Some Christmas traditions are clearly biblical, while others are clearly pagan, and some are more difficult to pin down. 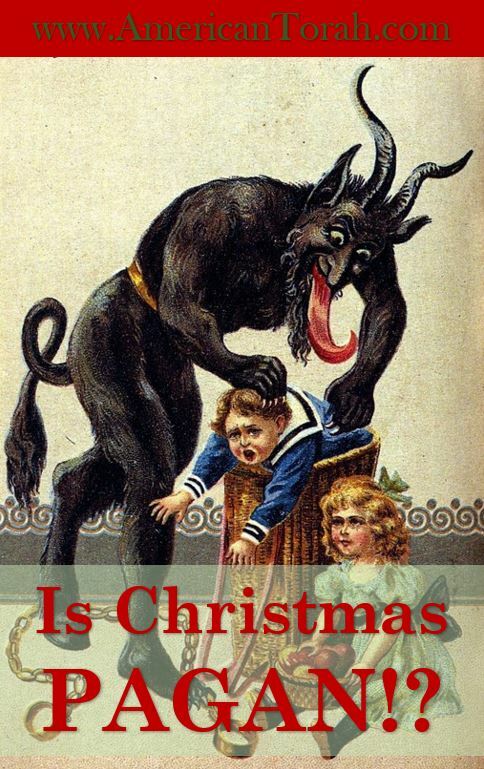 Google the words “pagan” and “Christmas,” and you are sure to find plethora of sites declaring everything about Christmas to be purely pagan and evil. You will also find sites claiming that everything about Christmas is purely inspired by God with not a speck of yellow to mar the pristine snowy landscape. Who’s right? I am no expert on the subject. In fact, I haven’t even read a single book on it. I’ve read a lot of articles, listened to speeches, and sat in on debates, though. So, for whatever it’s worth, I’m going to give you my thoughts on it. From what I’ve read, December 25th was decided on as the birthdate of Yeshua relatively early on in Church history. Unfortunately, it was still decided at least a century after the fact, and it was decided by Greeks and Romans who wouldn’t necessarily understand all the nuances of the Jewish Gospel writers. Matthew, Mark, and John were all native Jews, and Luke was a proselyte at a fairly young age. There are some people who seriously believe that Yeshua was actually born on December 25th, but they are a minority. Most believe he was actually born on some other date, either in the late spring or early fall. Competing modern traditions point to the pagan holidays of Saturnalia and the many other winter solstice celebrations to explain how December 25th earned the title. One tradition says that most of the cultures encompassed by the Roman Empire had some kind of winter solstice celebration, which generally fell very close to December 25th. That tradition is undoubtedly correct on that point, but it goes further. It says that Roman Christians didn’t want to appear to Jewish, so instead of celebrating a new holiday at a different time of year, they melded the new ideas into their existing celebrations. In that way, they would be celebrating Christmas at the same time everyone else was celebrating Saturnalia, and they wouldn’t stand out from the crowd. This sounds like a reasonable explanation, but as far as I can tell, it is only speculation. The solstice celebrations were certainly real, but I have never heard of any solid evidence that this was the motivation for selecting this date for Christmas. A competing tradition says that the Roman Empire instituted the formal holiday of Saturnalia in order to compete with the growing popularity of the Christian holiday. I have at least heard of some documentary evidence that Saturnalia was not officially recognized by the Emperor until after Christians had already adopted the 25th for Christmas. Of course, that doesn’t mean that Saturnalia had not already been celebrated unofficially, so it doesn’t disprove the previous argument. Another argument against December 25th is the fact of shepherds tending their flocks in the hills at night. I have heard it argued that no shepherd in Judea would have been tending flocks outdoors at night on December 25th. The shepherds supposedly drove their flocks into barns or warmer climes, I’m not sure which. This sounds like something invented by people with no actual knowledge of sheep or shepherding. The counter argument is that it rarely gets below freezing in that region even in December, and that shepherds routinely tend their flocks under those conditions. I have no way of knowing which is right. 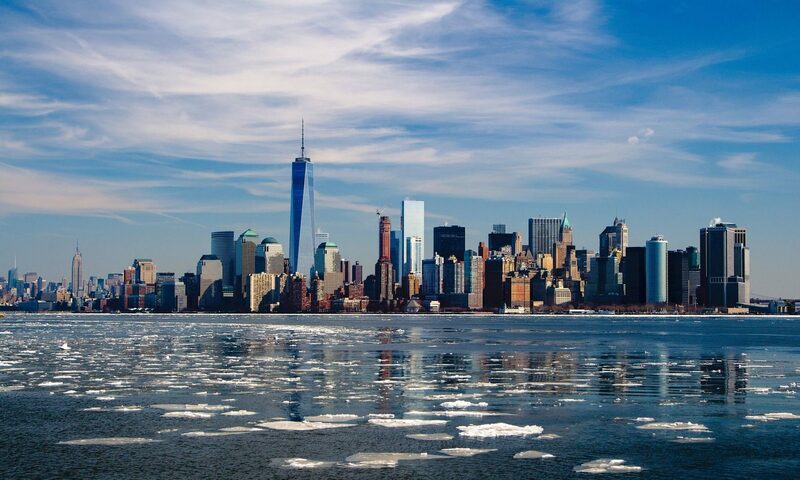 I know that in modern times the temperature does occasionally fall below freezing, but that it averages something closer to forty degrees Fahrenheit, but climates can change dramatically over two thousand years. Maybe it was ten degrees every night or maybe it was sixty. I have never seen any documentation of either claim. There is also the faint possibility that December 25th was chosen because it is possible that Yeshua was conceived sometime near Hanukkah, which is celebrated beginning on Kislev 25 and is always within a few weeks of December 25th. Kislev, being a month on a foreign calendar, was changed to December and the day came to be celebrated as a birthdate instead of as a conception date. More speculation. Absent proof of one hypothesis or the other, I’m not going to raise a stink about it. If everyone wants to celebrate Yeshua’s birth on December 25th, then I’m OK with that. Every report I have heard says that Christmas trees were adopted from a Germanic solstice tradition. One such report said that some Germanic tribes would bring a tree inside their house as some sort of talisman against the symbolic death of the shortest day of the year. The living tree within their home helped preserve their own lives and ensured another prosperous year. I have no clue if that is correct. So says the LORD, Do not learn the way of the nations, and do not be terrified at the signs of the heavens; for the nations are terrified at them. For the customs of the people are vain; for one cuts a tree out of the forest with the axe, the work of the hands of the workman. They adorn it with silver and with gold; they fasten it with nails and hammers, so that it will not wobble. They are like a rounded post, and they cannot speak. They must surely be lifted, because they cannot walk. Do not be afraid of them; for they cannot do evil nor good, for it is not in them. I doubt that Jeremiah was thinking of Christmas trees when he copied these words from God, but the parallel is too striking to ignore. The pagans are terrified of the signs of the heavens, signs like the winter solstice, in response to which they cut a tree out of the forest, bring it back to their house, and decorate it. Perhaps Jeremiah had never heard of the German people or their Yuletide traditions. Perhaps he thought he was only writing about carved idols inlaid with gold and silver. But then again, perhaps God had a wider perspective than Jeremiah. It seems obvious that, despite many efforts to apply Christian meaning to the Christmas tree, it is not of biblical origin. It was almost certainly adopted from some pagan religious rite. However harmless it might seem, I can’t see any way that it does not violate God’s command to not adopt pagan religious practices. Justifying it by saying we are doing it in his honor adds insult to injury. Does it help the adulteress’ case to claim she was thinking of her husband at the time? The Twelve Days of Christmas, Yule logs, Yule Tide, and Yule everything else is unquestionably pagan. There is nothing biblical about it, and claiming otherwise is pointless. I suspect the tradition of candles placed in the windows was adopted from Hanukkah, in which an 8 or 9 candle menorah is lit and placed where it can be seen through the house’s windows. While this tradition is not included in the Scriptures of the canon, it is not done in honor of any pagan gods. It is done solely in honor of a miracle that God performed in fulfillment of prophecies in Daniel and in preparation for greater fulfillments to come. I say light ’em up. One tradition says that gift giving was adopted from Saturnalia. Another says that it was instituted in honor of the gifts brought to Yeshua by the magi. Either one seems like speculation to me. I have never seen evidence either way. Wherever the mistletoe tradition came from, it wasn’t from the Bible or anything else surrounding the birth of Yeshua. I’m not sure if it has anything to do with a pagan religious practice either. It might be a superstition related to fertility, but not necessarily a fertility rite performed as part of any kind of worship. It could be something akin to Jacob’s striped sticks or Rachel’s mandrake. Once again, I have never heard of documentation for claims of pagan origins for the colors red and green. On the other hand, I can’t imagine how it might be derived from Scripture. I suspect it is a harmless tradition based on one of the most hopeful denizens of winter: evergreen hollies. Lest anyone think I might be turning into the Grinch, I am not interested in making anyone else conform to my opinions on Christmas. There will be no Christmas trees or Yule logs in my house, but you need to make your own decisions about it. I am not going to complain about nativity scenes or Christmas trees on public property, and I am not going to tell you you’re going to hell for your cheese log. These are just some rambling thoughts relevant to the day. They might even be wrong. As always, I reserve the right to change my mind. Have fun. Enjoy yourself. But consider giving your traditions a little more thought as to whether or not they please God. He is, after all, the reason for this and all other seasons. Is he not? There is not a single extraneous character recorded in the Torah (Matthew 5:18). Every word is written for a purpose, and there is nothing wasted. This is one reason why the names of wives are rarely mentioned: not because women were considered unimportant, but because their names were not significant to the point being made. So when the names of Lamech’s wives are given without further information about them in Genesis 5:19, we should immediately ask why. As a descendant of Cain and a probable murderer, Lamech is often used to argue that God does not approve of polygamy. “See? The first recorded polygamist was also a murderer and of the line of Cain. It must be wrong!” This kind of reasoning is based on the Law of First Mention, which is a theological land mine all on its own (see here), but apart from that, they are ignoring some important details in the story. Lamech’s wives names can be translated roughly as “ornament” and “shadow.” Ornamentation is a symbol of wealth and shadow is often used in scripture to symbolize a powerful patronage. Could Lamech’s wives symbolize wealth and power as mulitple wives often do? Perhaps one father-in-law brought him great wealth, and the other was a king or warlord. Lamech’s declaration that he would be avenged seventy-seven times was a declaration of independence from God and immunity to the vengeance of men. He believed his access to wealth and power provided him with greater protection than God. The point of Lamech’s story is not to highlight the evils of polygamy, but rather the evils of pride and the abuse of power.